Your child’s curls are precious. Treating them well is the first step in keeping them healthy, strong, and soft. However, there are so many parents that ask me about why their children’s curly hair breaks off and won’t grow. Inspired by the need to answer parents’ questions to this curly hair conundrum, I created a full range of products as a solution to these issues. 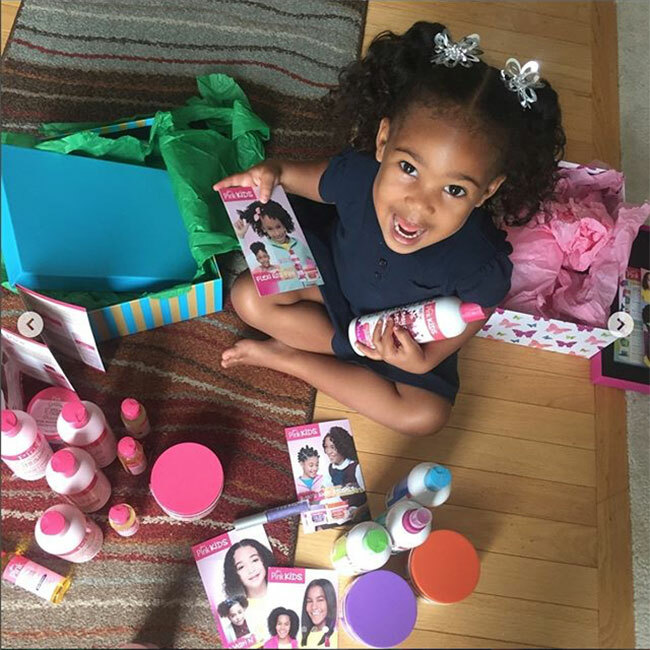 The Luster Pink KIDS collection is the perfect solution for your curly kids’ needs. So, let me take a moment to tell you just how easy it is to use and why you need it in your child’s hair curly care routine. The detangling process was excruciating for me because it was just annoying! It was something I dreaded every day, whether my mom would have to style my hair for school or not. Children and their parents shouldn’t have to suffer through this process. That’s why Luster’s Pink KIDS offers two different detanglers for various texture types. 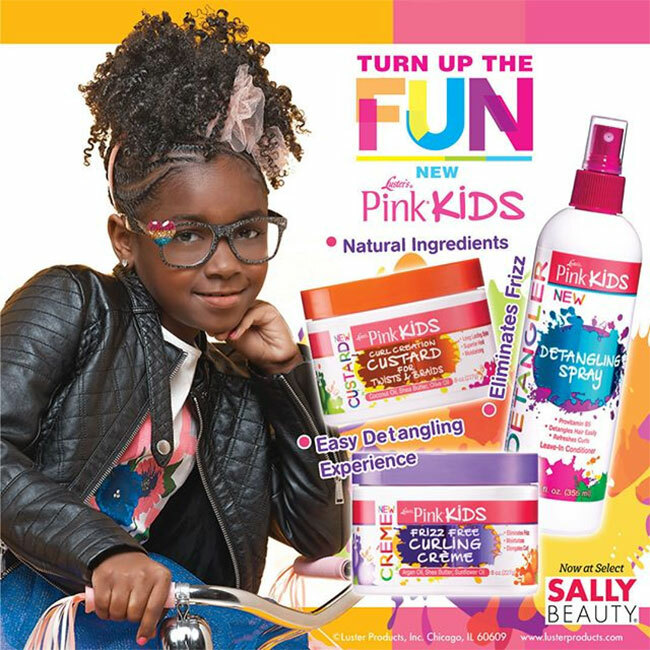 For children with fine to medium texture, choose the Pink Kids Detangling Spray for moisture and easy absorption for detangling and styling needs. For children with coarse textures, the Pink Kids Easy Comb Detangler is a more concentrated formula designed to soften, moisturize and smooth hair to easily release tangles. Having a cute style for a day is fine, but maintaining week long hairstyles is even better. That’s what I wanted to address when I created this collection for moms that wanted their child’s hair to hold long-lasting styles throughout the school week, not for just a day or two. Depending on the type of hair the child has, certain products in the collection will work best. Children seeking wash’n’go styles will love our Pink Kids Frizz Free Curling Cream for ponytails and pigtails. 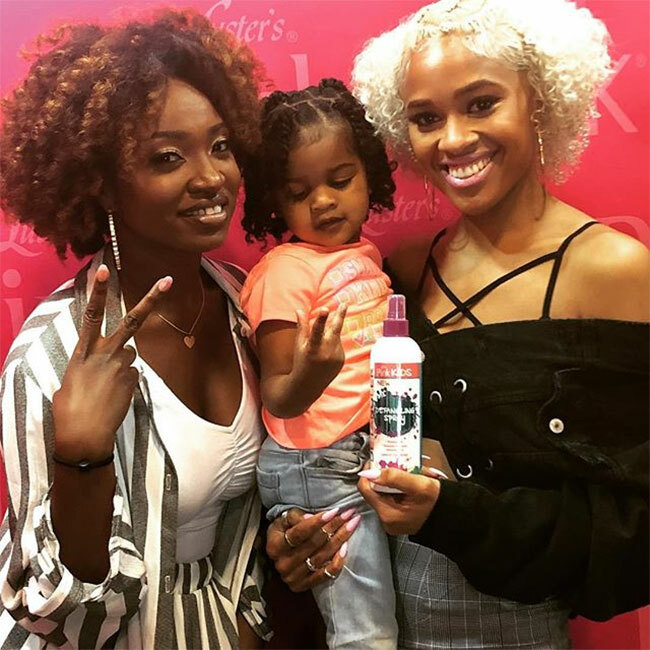 While parents seeking to achieve long-lasting Two-Strand Twists, braids and Bantu knot styles would love our Pink Kids Curl Creation Custard for twists & braids. 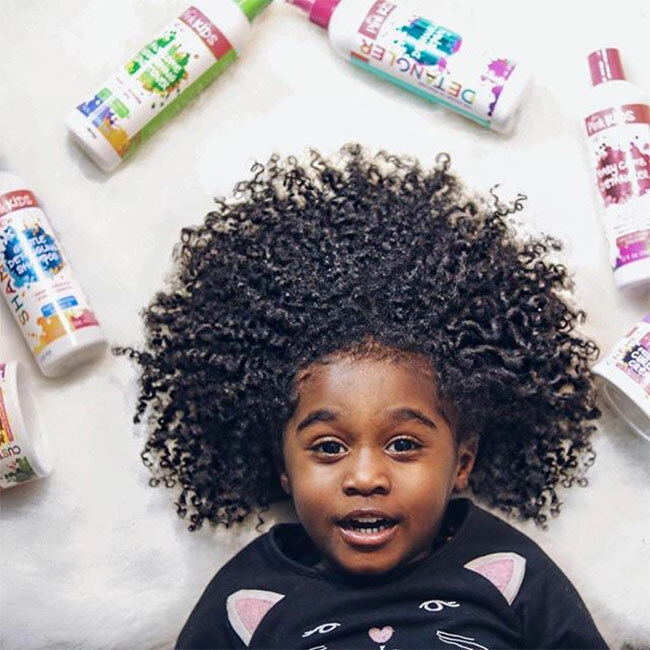 And, because of its firm hold, children with a tighter curl patterns (Type 4a-c) would prefer our Curl Creation Custard, especially for wash’n’go styles. Theoretically, hair grows ¼ to ½ inch per month. A healthy scalp produces healthy hair. Parents can create a healthy environment for hair growth by maintaining a clean and moisturized scalp. Also, healthy hair growth depends on the child’s diet and overall health. Make sure that they stay hydrated and eat lots of vegetables. I would also love to stress the importance of properly detangling curly hair. It is important that a parent take their time and begin detangling the hair starting from the ends and working their way up to the scalp. This method will help to eliminate breakage and damage as well. In addition to creating the Luster Pink KIDS collection, we’re focused on giving back to the community. We held a Black Panther premiere in both Chicago and Philadelphia for inner-city youth, buying out movie theaters and providing parents and their kids with free popcorn and beverages. Last year, we did the same thing when Hidden Figures premiered because we really want our youth to see all the things they can achieve. We wanted the children to see that they can grow up to do more than just “get by”. They all can go above and beyond; and look at the rewards they will get! We also hosted a Pink Kids Power Tour at 7 different Walmart locations across the country. The tour consisted of dance contests (1st place won $1000 and 2nd place won $500), Pink Kids hair makeovers, and meet & greet time with our celebrity dance contest judges. We also gave away our signature Pink Kids lip glosses and basketball sets. The Luster Pink KIDS collection is more than a product offering. It is my commitment to making parents and their curly kids’ hair journey easy to navigate and, most of all, healthy. 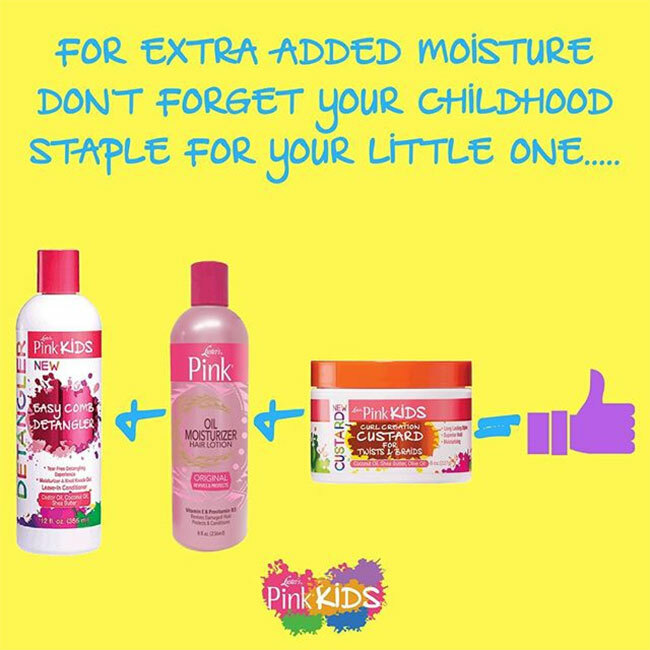 There’s no need to wait for moisturized hair for your child; get the Luster Pink KIDS collection you need today! This post is sponsored by Luster Pink KIDS collection.